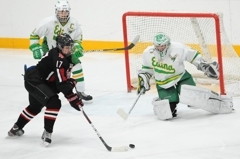 Louie Nanne is just a junior, but on this Edina team he might as well be Methuselah. A mainstay with the Hornets since his freshman season, Nanne is a grizzled veteran compared to most of his fuzzy cheeked teammates. 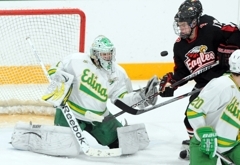 Edina’s roster includes just two seniors, one of which, goaltender Connor Beaupre, has missed much of the season because of injury. There are seven sophomores and two freshmen in the lineup, and most all of them have been plugged into high-profile roles and while playing the most important minutes. Nanne was a fearless freshman on the Hornets’ team that won the 2010 state Class 2A championship. He’s a mucker, grinder, playmaker, scorer, and now, perhaps most importantly, a leader. “It’s nice to kind of be able to take them under our wing as juniors,” said Nanne who scored a goal and was on both the receiving and giving end of some of the game’s biggest hits in the Hornets’ 4-1 triumph over Eden Prairie on Saturday, Dec. 17, in the finale of the Edina Holiday Classic at Braemar Arena. 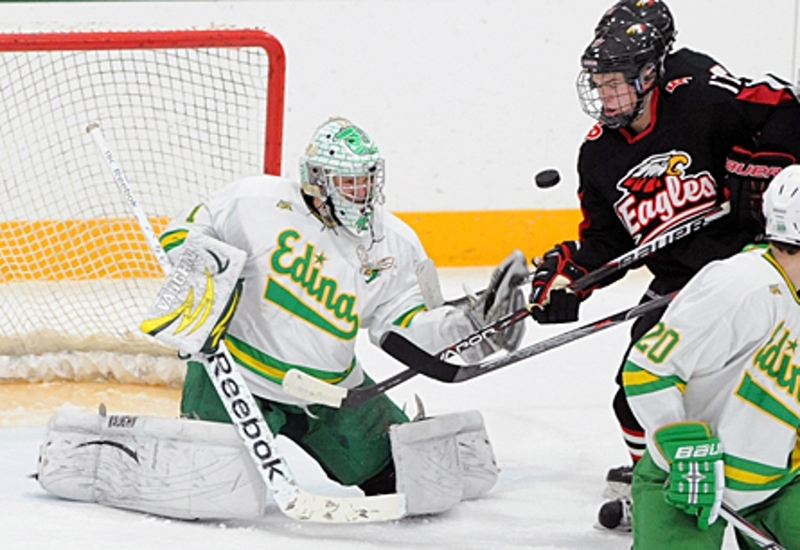 Edina, ranked No. 9 in Class 2A, not only beat the No. 8-ranked Eagles, but also knocked off No. 6 Grand Rapids 4-3 in the tournament opener on Thursday. Also included in the Hornets’ unbeaten run through their tournament was a 4-1 triumph over Elk River. 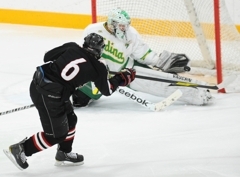 Sophomore Connor Hurley scored against Eden Prairie to boost his team scoring lead to 15 points. Freshman Dylan Malmquist added an assist and ranks second on the Hornets with 11 points. “We’re not hiding anybody, we are playing everybody,” Edina coach Curt Giles said after the Hornets won their seventh game in eight starts. “We wanted to get everybody up to speed as quick as we possibly can. We know that is going to take 25 kids to be successful this year. So we wanted to get them as much experience as possible. Even with its brigade of diaper dandies, Edina looks like the same old Edina. Which is to say the Hornets’ play at a breakneck pace, are ultra-aggressive in the corners and in front of the net and make opposing teams scratch and claw for every scoring opportunity. 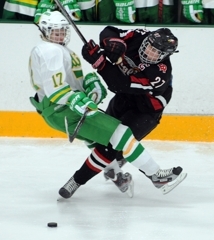 “Typical (Edina) team,” Eden Prairie coach Lee Smith said. “You are going to have to work for your goals. While not the most flashy of offensive talents, the smooth-skating Nanne possesses above average speed and soft hands, as his sharp angle shot into a dinner-plate-sized opening showed. 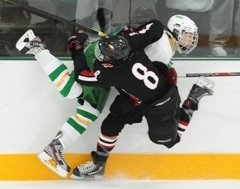 Not on this Edina team. 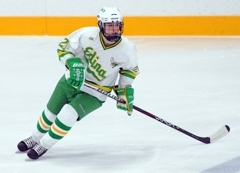 Nine Edina players registered at least one point -- including Connor Hurley who had a goal and an assist -- in the Hornets' 4-1 victory over Eden Prairie on Saturday, Dec. 17, in the finale of the Edina Holiday Classic. 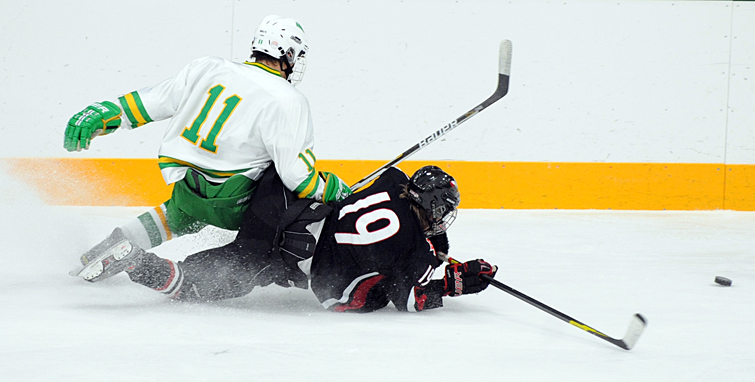 After trading goals in the first period, Edina scored twice within 23 seconds early in the second period setting the tone for the rest of the game. Junior goaltender Willy Benjamin made 25 saves for the Hornets. Despite being credited with the loss, Eden Prairie received yet another solid outing from sophomore goaltender Derrick LaCombe, who made 31 saves. 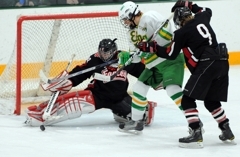 Edina finished the weekend 3-0-0 in its tournament, giving the Hornets the best record of the event's 30th installment. 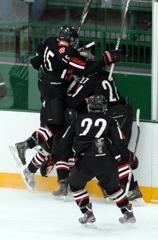 Eden Prairie (4-1-1) will look to bounce back from its first when the Eagles travel to face Burnsville on at 7 p.m. on Tuesday, Dec. 20. 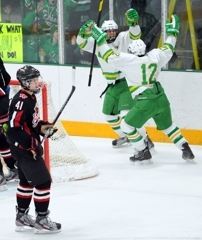 After playing a hectic schedule to open the year, Edina (7-1-0) will be off until 8 p.m. on Monday, Dec. 26, when the Hornets face Blaine -- a rematch of a 2011 state Class 2A quarterfinal matchup -- in a Schwan Cup Gold Division quarterfinal at Ridder Arena in Minneapolis. After constantly swarming the net looking for a scoring opportunity, Hurley's third period goal came several feet away from the net as the sophomore sniped a top corner and sealed the Hornets' victory. 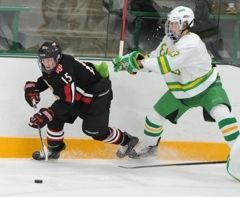 Hurley also assisted on Louie Nanne's second period power play goal and drew the attention of both Eden Prairie defenseman and the Edina home crowd. 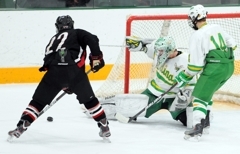 With Edina senior goaltender Connor Beaupre out with an injury, Benjamin has filled in nicely as the Hornets' starting goaltender. The junior continues to prove his worth making 25 saves to defeat the reigning Class 2A state champions. 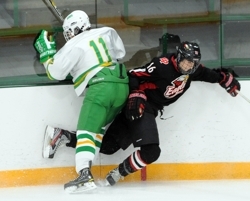 Benjamin went 3-0-0 during the Edina Holiday Classic to improve his record to 5-1-0. Two of the goals LaCombe allowed were point blank, punch-in chances and the other two goals were snipes about as good as they come. Tough for any goaltender to stop much less a sophomore playing in his third varsity game. 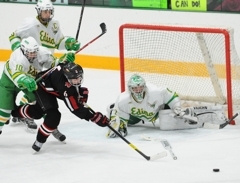 LaCombe made 30 saves and showed shades of the brilliance he displayed during Eden Prairie's 2-1 victory over Eagan on Thursday, Dec. 3.